LOS ANGELES (AP) _ Andre Agassi played for the first time in two months and rolled to a 6-1, 6-0 victory Tuesday night over unseeded Jean-Rene Lisnard in the second round of the Mercedes-Benz Cup. Sidelined by a back injury since losing in the first round of the French Open in May, the 35-year-old Agassi covered the court well against his overmatched French opponent, scurrying crosscourt several times to chase down shots. Agassi took just 47 minutes to beat Lisnard, who lost in qualifying but was pulled into the field because of withdrawals. After his back began acting up at Roland Garros, Agassi had to miss Wimbledon for the second consecutive year. He intended to return to competition last week in Indianapolis, but pulled out because he was taking longer than expected to recover from the sciatica nerve injury. 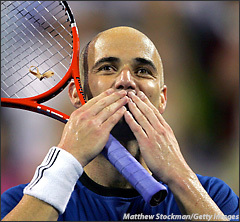 Agassi is the three-time champion and the top-seeded player of the tournament at UCLA. Defending champion Tommy Haas of Germany played for the first time since tearing a ligament in his right ankle at Wimbledon and also won in straight sets. The fourth-seeded Haas was a 6-4, 6-4 winner over 6-foot-10 Ivo Karlovic of Croatia. 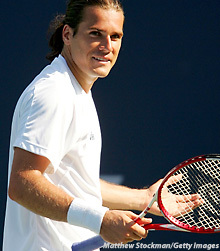 Haas will meet Xavier Malisse of Belgium in the second round and is a potential semifinal opponent for Agassi. Fifth-seeded Taylor Dent and unseeded Mardy Fish, scheduled for Tuesday night's last match, withdrew a few hours before they were to take the court. Dent pulled out because of lingering effects of heat illness that caused him to retire in Sunday's final at Indianapolis. Fish withdrew because of a sore right wrist. Haas beat Agassi in last year's quarterfinals then won the title by beating countryman Nicolas Kiefer. Kiefer won't be around for this year's final, though. The No. 3 seed retired due to respiratory problems while trailing James Blake 3-2 in their first set Tuesday. ``Just coming out here trying to defend my title is obviously very satisfying for me,'' Haas said. ``Sometimes I still don't have the right movement, sometimes I still think about my ankle a little bit. In other matches, second-seeded Dominik Hrbaty beat Slovakian Davis Cup teammate Karol Beck 6-4, 6-1; Zack Fleishman, a qualifier ranked No. 345, upset No. 9 seed Vincent Spadea 4-6, 6-2, 6-4; Amir Hadad of Israel beat Cecil Mamiit 2-6, 6-3, 6-3; Gilles Muller of Luxembourg defeated Sebastien de Chaunac of France 2-6, 6-3, 7-6 (6); Jan Hernych of the Czech Republic ousted Jonas Bjorkman of Sweden 6-4, 6-4. Haas, who hadn't played a match since losing to top-ranked Roger Federer at Halle, Germany, in early June, said he originally planned to return to the tour at Montreal Aug. 8. But he decided to play Tuesday after doctors assured him there was little risk of reinjuring the ankle.